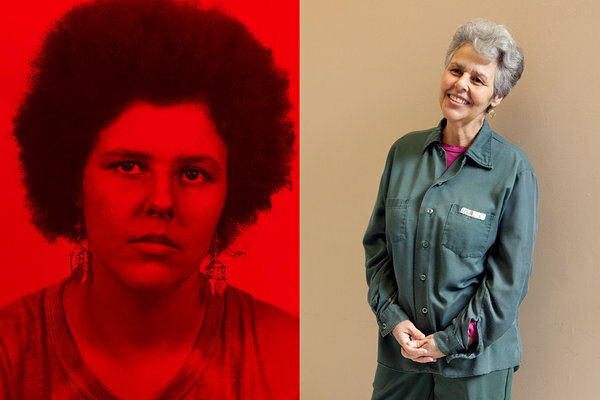 The cover story of the January 15, 2012, New York Times Magazine describes the life of former Weather Underground member Judith Clark, who has been incarcerated by the New York Department of Corrections since 1983. Clark is serving a seventy-five year sentence, and according to writer Tom Robbins’ account in the Times as well as many prison officials who know Clark personally, she has changed dramatically during the decades of her incarceration. In fact, in every statement I have ever read from someone who actually knows or has spent time with Clark in recent years, she is not only a model prisoner but a peacekeeper and a caretaker within Bedford Hills (the prison where she has lived for most of her incarceration). She has a long record of teaching other prisoners and of volunteering in service programs at Bedford Hills–including the infant care program, the HIV/AIDS program, and the program which trains service dogs which are eventually given to disabled people outside the prison–which drastically improve the quality of other people’s lives. Judith Clark has managed far more effectively than most people, in or out of prisons, to give back to those around her and to be a positive and sustaining force in the lives of others. The passing of time changes people, often drastically, and the youth we lock up today will not be the same people in twenty or thirty years. This is a critique that anti-death penalty activists often make; the person being executed is more often than not a very different human being than the one who committed the crime or sat before a judge at sentencing. Is it just to continue to punish someone who is not only repentant but who has a great deal to contribute to the world outside prisons? Is this the most useful way to spend New York taxpayers’ money or a deterrent to crime? Decidedly not. The bigger question here is one about the purpose that prisons serve and whether or not they adequately fulfill their function in our society. As criminologist Stephen Richards declared, “A successful corrections system doesn’t grow. If they were correcting anybody, they’d shrink.” Yet incarceration rates continue to soar. We are warehousing 2.3 million people in the U.S. and making no feasible plans to reintegrate this huge population safely back into our homes and neighborhoods, though the vast majority of them will be released from prison someday. We supposedly believe that prisoners pay a debt to society by serving time and by thoughtfully contemplating their wrongdoings, which was the expressed purpose of the Quaker penitentiaries–our nation’s first prisons. No amount of time served can undo past crimes, so the best use of our penal system would be to help shape those who committed prior offenses into law-abiding citizens who understand their past transgressions and commit themselves to living peacefully and productively in the future. Judith Clark exemplifies the sort of transformation that can occur when a prisoner understands in meaningful ways how the actions that landed her behind bars had a negative impact on the lives of others. We are no safer because she continues to live behind bars today. Judith Clark is one of a great many U.S. prisoners who have served multiple decades behind bars. We are locking up so many elderly prisoners that nursing home and hospice care programs, like the one in the Louisiana State Penitentiary at Angola, are becoming necessary. Angola actually has a prisoner-run organization for a group they call “longtermers”–men who have served twenty-five or more years. Since Louisiana has some of the harshest sentencing laws in the U.S. and a natural life without parole sentence, the longtermer population has grown to over 500 men. The Human Rights Club–another prisoner organization at Angola–helps indigent prisoners, the elderly, and longtermers. As you can imagine, these club members stay very busy trying to tend to the needs of such a large population with so many urgent needs. The Human Rights Club aims to bring dignity and a measure of comfort and recognition to men who have survived for so long in such an inhospitable environment. Every other year the Human Rights Club sponsors a celebration called Longtermers Day where the men enduring these interminable sentences can gather together. Many of them, even old friends and family members living in the same prison, have no opportunity to see one another during the rest of the year because of the ways in which the prison segregates groups of men based on where they are housed. Volunteers from the free world and prisoners’ family members are invited to spend the day inside the prison, mingling with the longtermers and enjoying the food and performances that brighten the occasion. I was twenty-five years old the first time that my mother and I attended Longtermers Day. Several members of the Angolite prison news magazine staff had invited us, and we found ourselves in a chow hall densely filled with men who had been in prison longer than I had been alive. Few family members attended the event, and many men told us how the years in prison had eroded their relationships with their families entirely. We saw quite a few very frail, elderly men, several of them in wheelchairs. One man explained to my mother that he had a life sentence for stealing a toaster–the result of a harsh mandatory sentencing law for repeat offenders. Many of these longtermers were too ill or weak to have harmed anyone even if they wanted to. Many were children when they entered prison and had never had the opportunity to live as responsible adults. Others had stories more like Judith Clark’s; they had entered prison angry and over the long years had come to understand their crimes and their lives very differently. I see no utility in such prolonged detention. If any of these longtermers remain unfit to return to free society, it is because we have not adequately helped them to prepare. Locking up so many people for multiple decades makes no sense financially, morally, or practically, and in doing so we irreparably damage many lives beyond the thousands of people serving these long sentences. In a different way, their families serve this time with them. Judith Clark has a daughter. Harriet Clark was so young at the time that her mother went to prison that she likely cannot remember a time when her mother was free. As Nell Bernstein has argued in her book All Alone in the World: Children of the Incarcerated, prisons punish children who have not been convicted of any offense alongside their imprisoned parents. Much legal and popular rhetoric condemns the incarcerated as having lost their rights to spend time with their loved ones because of the behavior that sent them to prison. The law fails, as Bernstein so rightly asserts, to examine the rights of prisoners’ children and to even engage the question of whether or not having access to their parents should be protected. Prisons focus solely on punishing those deemed unfit to live among us, and we rarely examine the impact that mass incarceration has on those who are not convicted of any crime, those who do not live in prisons but whose family lives, economic and emotional stability, and self-preservation are tied to prisons, courts, and police. Harriet Clark and I have both fared far better–in terms of economic stability, access to education, and the avoidance of our own incarceration–than the average prisoner’s child, undoubtedly because we were each left in the capable hands of other responsible adults who were able to provide and care for us. I do not know Harriet Clark and cannot speak for her, but if the Times article accurately represents her, she loves her mother dearly and remains very connected to her. Though she is now an adult, I believe that she deserves–indeed she is owed by the state which sentenced Judith Clark with the outrageous and impractical sentence of seventy-five years–time with her mother in the free world. A number of progressive organizations throughout the U.S. are working to implement programs to help maintain the bonds between incarcerated parents and their children. The most ambitious of these initiatives enable mothers and young children to live together in a facility which provides parenting classes, substance abuse treatment, and early childhood education all under the same roof. The Texas Observer‘s January 2012 cover story profiles the Baby and Mother Bonding Initiative (also known as BAMBI). Opening this facility in April 2010 is perhaps the only sensible thing that the Texas Department of Criminal Justice has done in decades. Thus far, not a single graduate of the BAMBI program has been sent back to prison since her release–a significant victory considering that the last Bureau of Justice National Recidivism Study (published in 1994 and rather out of date now) showed that around 67% of those release from prison ended up behind bars again within three years. BAMBI and other programs like it are very likely to help prevent the future incarceration of prisoners’ children as well. It’s time for Judith Clark and many, many others who have served decades in prison to be allowed to live a better life, to actively give back to the world outside prisons, to spend time with the children and families who have waited these many years for the simple pleasure of a conversation held without guard supervision. If we believe that our corrections system is in any way functional, we must grant longtermers the opportunity to demonstrate their abilities to live better than they did before their time in prison. Though I never thought I would become interested in the politics or pet cause of a winner of the Miss America Pageant, the newest beauty queen to take that prize has won my admiration. Laura Kaeppeler, the former Miss Wisconsin, has decided to spend her year as Miss America helping the children of the incarcerated. Her father served eighteen months in prison, and Kaeppeler speaks movingly about wanting to prove to kids throughout the U.S. that you can still have a positive and strong relationship with your incarcerated parent. She also focuses her comments on her father’s incarceration on her admiration for him and on the strength of their family’s bonds with one another rather than on his crime. She speaks of building a future for the children of prisoners and of wanting to be a role model for kids who might not realize that they can break the cycles of incarceration seen in so many families. In a nation where we currently incarcerate over 2.3 million people, the children of prisoners must necessarily become a visible population. We are cropping up in unexpected places, and Laura Kaeppeler and her family are being very brave to make themselves vulnerable to the types of criticism that are likely to be leveled at them because of Kaeppeler’s new level of fame and her openness about being a prisoner’s daughter. Kaeppeler has an opportunity this year to start difficult conversations and to raise awareness–and perhaps funds–to help prisoners’ children. Perhaps the most powerful contribution she could make would be that of helping to diminish the stigma of criminality surrounding these children who are often funneled away from educational and professional resources because of expectations that they will follow in their parents’ footsteps. Kaeppeler is a new symbol of what it means to be American, and far more of us are prisoners’ children than beauty queens. Last night I went to see a performance of Nilaja Sun’s one-woman play No Child. . . at PlayMakers Repertory Theatre on UNC Chapel Hill’s campus. The play, which Sun has been touring since 2005 and which she has now performed over 700 times, comes out of her experiences working as a teaching artist in New York City’s public schools. Transitioning deftly among the sixteen characters in the show, Sun embodies a dysfunctional community of teachers and students in a sixty-five minute performance, narrated not by the character of Sun herself but by the school’s custodian who observes the struggles unfolding around him with the empathy and omniscience of the Stage Manager from Our Town. The janitor sees not only the children who are raising themselves while their single mothers work three jobs and the teachers who fear their own pupils but also the failing infrastructure that surrounds them: holes in the ceilings, bathrooms that have not been functional for years, the steady stream of faculty, staff, and students who leave the school abruptly and do not return. Security guards and NYPD officers flank the entrances to Malcolm X High School (the play’s setting), screening all who enter with metal detectors and X-ray machines. This security equipment appears to be the most expensive and new technology in a school where little else seems new or technologically advanced. The fictional Malcolm X High where No Child. . . takes place and the real schools where Sun continues to work as a teaching artist have failed their young charges for so many years that hardly anyone in the system can imagine an effective formula for change. In the play, Sun enters a class deemed one of the toughest in the school with a plan to stage a production of Timberlake Wertenbaker’s Our Country’s Good in six weeks. Though the students have no theatrical or performing arts background, Sun manages to get them interested in this play by helping them to articulate the ways in which the prisoners in Our Country’s Good are constrained by social forces not dissimilar from those the students face every day. As the students in the classroom begin to relate to the script, they list the many ways in which they feel like they are treated like prisoners in their daily lives. The litany of reasons includes the screenings of their bodies and belongings as they enter school each day, the orders shouted to them from parents and teachers, and the fear that they inspire in the adults on New York’s buses and subways. In a mirroring of the plot of the Wertenbaker play, Sun’s students find new levels of self-confidence, discipline, and hope in performing a play for the first time; they can begin to imagine what their own versions of success might look like because they have been made to feel important, accomplished, and recognized, and they know that they have earned this sense of achievement because the road to opening night was not at all easy. As much as all of us arts teachers in the world would love to believe the pretty fiction that creative expression can somehow save us all, it’s never that simple, in real life or in Sun’s play. Not all of Sun’s characters survive to the end of No Child. . . and those who do don’t waltz off into the sunset, though at least one of them gets a degree from an Ivy League college. What arts programming, like that described in this play and enacted by Sun through her work in the public schools, can do very effectively is to open a window of possibility. Not all students will be able to completely transform their lives, but as Sun said in the discussion after last night’s performance, arts teachers can help students recognize their own humanity and become more whole, while curriculum designed to prepare students for standardized tests has the opposite effect. Every one of the student characters in No Child. . . reminded me of kids I have met in juvenile detention centers during the years that I have done theatre work in youth detention facilities. For well over a decade now scholars have been pointing to the “education to incarceration pipeline” as being one of the strong causes of our skyrocketing rates of imprisonment among minors. When young people do not learn in school that they have viable prospects for a fulfilling and economically sustainable life, they often turn to crime as a way to make easy money or attain their goals of self-sufficiency and luxury. Teaching to meet the standards of the Bush Administration’s No Child Left Behind policy in fact has caused a great many children to be lifted out of the system entirely and placed in locked facilities where their test scores will never be measured. In moments of educational malaise or more active crises (as we saw in the New Orleans public schools after Hurricanes Katrina and Rita) we authorize police to enter schools to maintain the peace, and as a result disciplinary measures which are ordinarily handled by school administrators, such as truancy and minor fights among students, become prosecutable crimes. Brian Bilsky and Meda Chesney Lind’s chapter in Razor Wire Women does an excellent job of explaining how we hold children as prisoners for crimes that adults cannot commit, such as running away. No Child. . . is a frightening wake up call for those who have not seen first hand how little hope so many young people in failing schools now have, and at the same time it is an excellent reminder that performance can help struggling students and Sun’s audiences alike to imagine a better future for us all. Our Children’s Place, a wonderful advocacy organization in Chapel Hill, North Carolina, is hosting a symposium on the children of incarcerated parents at the University of North Carolina’s Friday Center. The event will take place on February 14, 2012 from 8 AM to 4 PM and is sure to be an incredible event. Register now for the symposium: What About the Children Brochure. An autographed copy of Razor Wire Women will be raffled off at the end of the symposium. Register today! Republican legislators in North Carolina kept the House in session after midnight last night in an unsuccessful attempt to override Gov. Purdue’s veto of the Racial Justice Act. The Republican dominated Senate voted to overturn Purdue’s veto, but the conservatives in the House lacked the support they needed from Democrats to cripple the Racial Justice Act. This morning I was rereading the late Dwight Conquergood’s seminal article “Lethal Theatre” which appeared in Theatre Journal in 2002. For those of us who study theatre and performance studies, Conquergood’s powerful treatise on the performative nature of the death penalty was a game changer. People who do social engagement work in the arts have long known that imagery and public discourse can have enormous impact on political struggles, but Conquergood argues very convincingly that we kill people as a means to prove how just and righteous we are. The condemned serve as the symbolic antithesis of the good law-abiding citizenry who take it upon themselves as a body politic to smite those who have done wrong. We build our freedoms on the backs of those who are not free, and we mechanize state-sanctioned murder to remove individual agency from the act of killing. Critics of the Racial Justice Act, including some very outspoken Republican legislators, have said that this law is a thinly veiled attempt to do away with the death penalty. In fact, the Racial Justice Act merely strives to make our use of the death penalty less biased against people of color. It is an important legislative move, but it does not go far enough. As Conquergood pointed out nearly a decade ago, we have known for a very long time about the staggering inequities in our justice system, especially in the arena of capital punishment, yet we continue to kill people. This legalizes racism and entrenches popular notions of the criminality of the poor, African Americans, Latina/os, queers, the transgendered, immigrants, and the uneducated. The battle over the Racial Justice Act rages on, and a House committee has been formed for further investigation. So, North Carolinians, call and email your senators and representatives and do not yield! This legislation was hard won by people who believe that even those condemned to death deserve fair, unbiased consideration by the courts. It’s a significant step in the right direction, and we cannot afford to lose this ground. The Texas Department of Corrections (TDC) is at it again, working to diminish the lives of the incarcerated in the Lone Star State. No new prisons are currently being built in Texas because of the present state of the economy, yet we keep locking up our citizenry in ever-increasing numbers and leasing out prison bed space to the Department of Homeland Security for Immigrant Detention. The solution that TDC has come up with is to eliminate what little recreational space prisoners have in day rooms and gyms by putting extra beds in what used to be the only spaces where prisoners could relax or get exercise. TDC has conveniently managed not to expand the restrooms or shower facilities as it adds more beds to each prison wing, which already houses on average ten more prisoners than the housing unit was meant to hold. This will cause incredible sanitation problems and public health issues for the folks locked up in Texas prisons. Sanitation problems on a large scale will occur in the restroom and shower facilities of Texas prisons if the overcrowding continues to expand. Please prevent the addition of fifteen new beds in each day room space, and remove the ten beds currently encroaching into each day room. Please do not take away gymnasium and exercise facilities and deem them replacement day room spaces. Please do not add prisoners to any TDC facility without first putting in place sufficient numbers of toilets, sinks, and showers to serve the expanding prisoner population. My former student Jamila Reddy just sent me this link to a website about a proposed mural project with incarcerated mothers at Riker’s Island and their children. The incarcerated mothers will create an image which their children will paint in East Harlem, and the children will create an image which their mothers will paint inside the prison. The video on the website shows artist Katie Yamasaki’s incredible previous mural work, which is very socially engaged. She has collaborated with communities of women all over the world, and this project promises to produce amazing results as well. Yamasaki is trying to raise the funds necessary to make these murals a reality. This is the kind of place where I wish my tax dollars were going. Very few activists or artists have such excellent ideas for connecting communities separated by prison walls. Yamasaki’s efforts are inspiring and inspired. Do not miss the chance to support this incredible work!